Who doesn’t love a good chocolate scone? 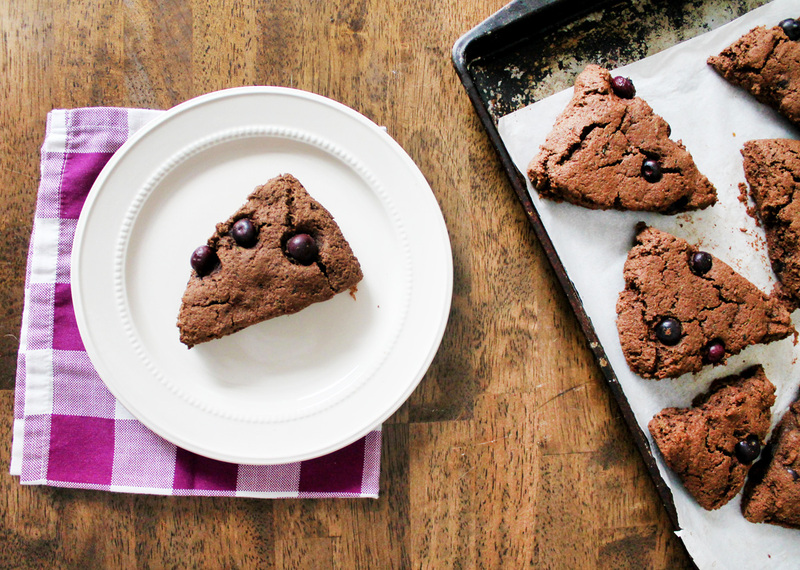 Chocolate scones are some of our favorite luxurious scones, though they can often come with a side of guilt because of it. So, in an effort to squash that guilt, we are working overtime here to bring you a decadent — yet slightly healthier — chocolate scone. 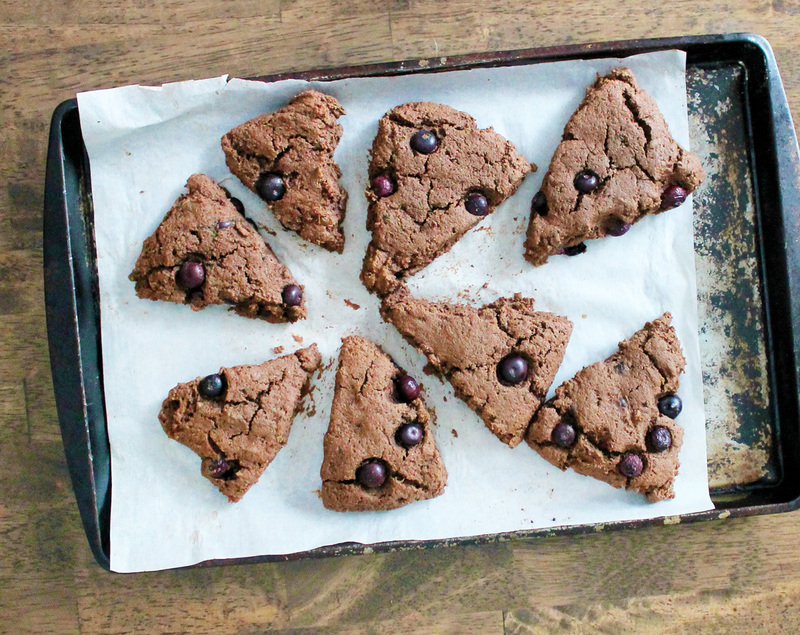 We did this by making chocolate zucchini scones with whole wheat flour. We even added blueberries for a pop of additional flavor and antioxidants. These scones are incredibly delicious and moist, with a texture more like chocolate cake than a scone, but still in that easier-to-eat scone package. It’s the zucchini that gives them that moist decadence but also brings the health factor. Then comes the pop of tart and juicy freshness from the blueberries. We added a pinch of cinnamon, ginger, and nutmeg to help all these different flavors melt together. 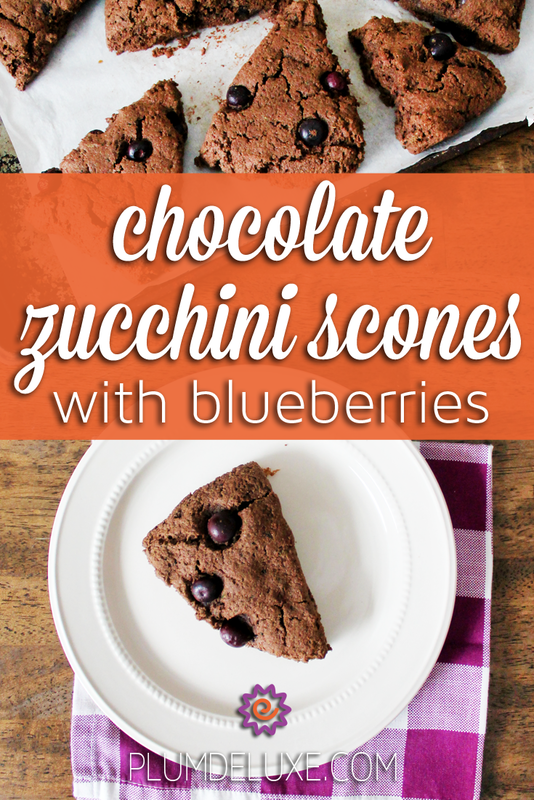 These chocolate zucchini scones can be served as either a decadent breakfast or a simple evening dessert. You could even try combining them with our red velvet scones and apricot chocolate chip scones for a trio of teatime desserts. We are pretty sure your guests will find something they like in each of these sweet scones. 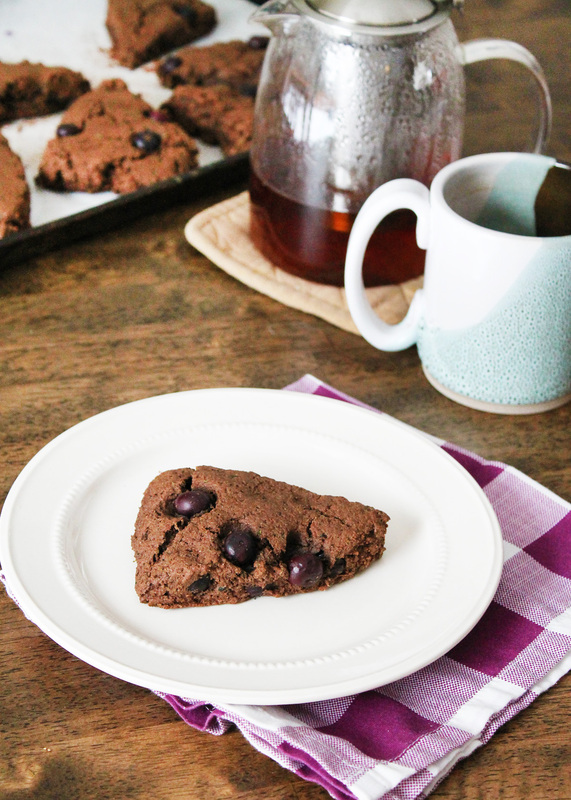 We would absolutely pair these chocolate zucchini scones with our Easy to be Green blueberry hibiscus tea. The sweetness from the hibiscus blends wonderfully with the chocolate, and the theme of blueberry is carried throughout the combination. Alternatively, a nice chai would also be a great option to pair with these scones, such as our Rainy Day Puerh sweet and spicy tea. The cinnamon, ginger, and nutmeg found in these scones are perfect companions for just about any chai. In a small bowl, sift together the flour, sugar, cocoa powder, baking powder, baking soda, salt, cinnamon, ginger, and nutmeg. Add the sifted dry ingredients to the bowl of a food processor with the cold butter and zucchini. Pulse until well combined. In another bowl, beat together egg and 5 tablespoons milk. Pour the egg mixture into the food processor and pulse again until a sticky dough comes together. Transfer the dough to a floured surface and gently fold in the blueberries. Use your hands to form the dough into a disc, about 1 inch thick, and slice into wedges. Move the wedges to a parchment-lined sheet pan. Brush the tops of the scones with the remaining tablespoon of milk and sprinkle sugar on top. Place in the oven and bake for 10-12 minutes or until puffed. Remove the scones from heat and set aside to cool. ← Is Tea Keto Friendly?